(PhysOrg.com) -- Skull fragments of prehistoric koalas from the Riversleigh rainforests of millions of year ago suggest they shared the modern koala's "lazy" lifestyle and ability to produce loud "bellowing" calls to attract mates and provide warnings about predators. 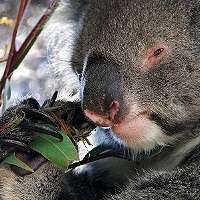 Modern koalas - the sole living member of the diprotodontian marsupial family Phascolarctidae -are among the largest of all arboreal leaf-eaters. To attain this remarkable condition on a diet of eucalyptus leaves, a notoriously poor and somewhat toxic food source, the tree-dwelling marsupials developed unique anatomical and physiological adaptations including specialized chewing and digestive anatomies and a highly sedentary lifestyle. The dramatic differences between the skulls of extinct and modern koalas, especially in the facial region, are probably related to the change to a tougher diet of eucalyptus leaves. The researchers believe that the prehistoric koalas also shared with their modern cousins the ability to produce loud "bellows" based on similar large bony prominences - the auditory bullae - that enclose structures in the middle and inner ear. However the auditory bullae of the extinct Nimiokoala and Litokoala species are not as exaggerated as in the modern koala, according to team member UNSW Professor Mike Archer. "They produce low frequency vocalisations that pass through vegetation and can be heard up to 800 metres away - far exceeding the home range limits of male koalas. The fossil koalas share similar large bony ear structures to the modern koala and would have been well adapted to detecting vocalisations in the rainforest environment of Riversleigh in the Miocene era."